Free is one of the oldest tools in the marketing sales kit. Get your first one free! Buy one, get the next one free. Start your free trial today! You know the drill. And you likely know that in most cases, it’s not really free. There’s a catch. Or a limitation. This is not a review or recommendations of what to use. It’s also not a validation of free. End-users invariably need to invest real money for media player and display hardware, and they will have soft and real ongoing costs for content and creative. So no network is free. While enterprise-grade software from some of the largest firms in digital signage can be costly, there are scores of options for commercial signage CMS platforms that come in at low to quite low costs per media player license, in the range of $10 to $25/month. 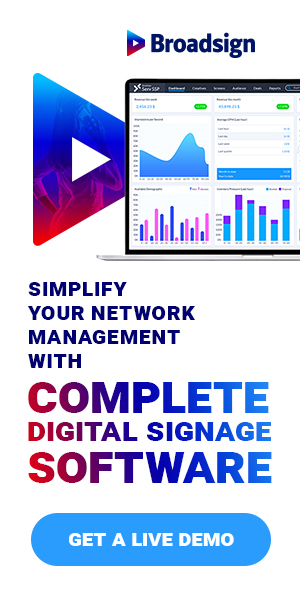 The best advice is to look first at the demands and workflows of a signage network, and sort out what’s needed. If a free platform does the job, great. If it introduces compromises and risks, is it worth it? When it comes to free digital signage software, there are many products touted in some form or another as free. It is very hard to stay on top of all the options out there and the variations on free, but we’re going to try – by category and by alphabetical order. These are software packages that have been developed by and supported by the open source community. To use them, you need to download the software, install them on your own servers (new or re-purposed), and then manage them. This tends to be work best left to people with an interest and distinct skills in information technology. Concerto: Concerto started at Rensselaer Polytechnic Institute (also known as RPI) in 2008. It was a student project to create a modern (and free) system to distribute announcements and information across campus without the campus-wide e-mail announcement lists and paper posters. It has remained open source and is still in active development. A software company that grew out of RPI now markets a commercial, hosted version of Concerto. Vodigi: Vodigi is billed as free, open source, interactive digital signage software solution that offers all the features you need to promote and advertise your products and services. However, active development on the software stopped in 2014. Xibo: Xibo is a complete digital signage solution comprised of a web-based content management system (CMS) and choice of Windows or Android signage players. It started as a university project in 2004. There is a low-cost version of Xibo, called Xibo in the Cloud. Open Splash: OpenSplash is free, open source software built to get playlist data and media files from a server. It was and is a project driven by Montreal’s Ayuda Media Systems, which markets a full static and digital solution for out of home media companies (a platform that is definitely not free). Supporting video walls, screen zoning with overlapping and depth order, and dynamic content, it is designed to be driven by any network-based content management system (CMS). OpenSplash does not have a CMS, and therefore is not a complete signage solution out of the box. The value for resellers and manufacturers comes from using it to build solutions. Screenly is a commercial digital signage platform built around the Raspberry Pi micro-PC, but it has a pair of free options. The commercial product has a limited free license, but more to the point, there is Screenly OSE. The OSE stands for Open Source Edition. It is free and backed by the user community and maintained by the software firm WireLoad, which is behind Screenly. All you need is a Raspberry Pi and a TV to run it. Rise Vision has been doing digital signage since 1992, they offer both free and paid plans. They have about 10,000 accounts in 128 countries. The Rise Vision CMS is fully featured, they offer hundreds of templates, and they release new content every week to make keeping your displays updated easy. Here are some of the templates they’ve released. Cignage: A Norwegian company has a free, limited functionality version of its software, with premium version that offers much more capability. Digital Recall: Since 2006, a Melbourne, Australia firm has marketed a free signage software application for Windows, operating on the business model that a percentage of users would require more functionality, which could be purchased as one-time licenses. The company also now has a commercial cloud version. DisplayOp: This German firm has three editions of its signage management software. The free version has limits on scheduling and management, and can only be used on a one player, one screen basis – meaning there’s no capability to management of network of players and displays. SignageLink: This appears to be a Chinese firm, which says its software is running on 100,000 players. doPublicity: This Fremont, California company has been at digital signage – among several businesses – for many years. It has a spectrum of versions, including a free one that has limits on functionality and none of the templates that come with paid versions. It appears to be SaaS-based, though it’s not so easy to sort that out. ScreenHub: A free, SaaS-based signage platform that is built around a responsive, HTML5-driven web app. MangoSigns: Based in the Tampa Bay-area, this company offers an entry-level free version of its platform, but has three higher tiers of service and support that are fee-based. MediaSignage: This Los Angeles company has been around for years, marketing a solution that starts at free but costs money as more sophisticated functionality gets added. Software is free for the cloud-based version of the product, which the company says gets users about 90% of the features of the paid Enterprise version. Storage is also limited in the free version. Mvix: The cloud-hosted software solution from this Washington, DC-area company is free, but feature-rich. There are no subscription fees. Mvix sells signage players for a one-time, upfront cost – bundled with the web-based software. There are different levels of signage devices – starting at $259 – and software widgets and features vary across systems. Mvix’s solution has no limits set on users, cloud-storage, playlists or schedules. The company has about 45,000 installed systems across 29 countries. Pickcel is a Bangalore, India-based software shop that offers a cloud-based CMS on a freemium basis. Pickcel LITE is free for a maximum of two displays and has a cap on cloud storage. For advanced options and to add more displays, you need to pay about $15/month per node. The service is built around Android players. Yodeck is a cloud-based CMS built around the Raspberry Pi, developed by a software shop based in Athens, Greece. Users driving just a single device get unlimited accounts for free. After that, additional units cost about $8/month. The company supports PCs and the Raspberry Pi micro PC. Yodeck has its own hardware player that uses the Raspberry Pi 3. PlaySignage is a Danish company that offers a free version of its software to drive a single screen. It is a fully featured version of the commercial account, the hook being that screen #2 and on cost a monthly fee to manage. Play says what sets it apart from competitors is a slide editor based around HTML5 canvas technology. PlaySignage is a product of a software development shop founded in 2013. The platform supports all major operating systems – Windows, Android, Amazon fireOS, Mac & ChromeOS. Linux is supported via Chrome extension, but a native player is also in the works. Ce labs : Like BrightSign, Ce labs markets high-reliability media players for signage applications, and bundles free management software. QuickSign Pro Designer is a FREE, fast and simple content management software tool that allows you to quickly layout, deploy and manage your digital signage content. Video Sign Player: New York agency and solutions company Show+Tell has developed a free, admittedly simple signage player that is available as an app off the Apple TV store for the new – repeat new – Apple TV. It doesn’t work on older versions. Chrome Sign Builder: Google has developed its own entry-level digital signage CMS to use with Chrome devices built by third-party manufacturers. Chrome Sign Builder is described as a digital signage utility that allows users to schedule and display content across your managed Chrome device. Set-up involves pointing to Web URLs and scheduling the devices to call them. It’s free, but device management using a Google toolset is $2/month per device. The WordPress blog content management platform is free and has a huge global developer and user base. Blogs like this one, and millions more, run on WordPress. It would be possible to run a free theme or develop one with available tools, but it was only a matter of time before a commercial theme was developed to drop on this free CMS. D-board: Italian start-up, coming soon, it says. Pixelydo: A free theme developed and refined by Chicago-based developer Nate Jones. WordPress Digital Signage: In beta development. It is related to a recently announced commercial service, called ScreenCloud. LG SuperSign TV – LG has an entry-level, small network solution that bundles management software and some commercial capabilities on consumer-grade TVs. It is not standalone software. There are also other flavours of SuperSign. LG also has smart panels running LG WebOS that can run signage off web URLs, with the panel running in kiosk mode. That can be with a commercial or free CMS, or just be a web page. The WebODS displays can also run SuperSign. NEC Digital Signage Software – NEC Germany downloadable software that only works with specific NEC display products. Also found for UK. The free NEC CMS that grew out of Vukunet – which is ad sales and serving for signage – is no longer available. Philips SmartCMS: Described as a free and easy-to-use content management system that works exclusively with Philips Signage Solutions displays to manage digital signage content. Samsung MagicInfo – MagicInfo is a smart, intuitive content creation and management solution available standard on Samsung Display Solutions products. There are, I believe, some aspects of MagicInfo that are fee-based. Samsung also has smart panels running its Smart Signage Platform that can run signage off web URLs, with the panel running in kiosk mode. That can be with a commercial or free CMS, with MagicInfo, or just be a web page. Sharp SDSS: Sharp’s Digital Signage Software, or SDSS, is described as a versatile software package delivers program creation, registration, scheduling and distribution of pre-scheduled information on Sharp “PN” series LCD monitors. I think BenQ also has software for its panels, and my safe guess so do many of the other panel makers. That’s the list. I can guarantee stuff is missed here. so please let me know eithert by email to dave at sixteen-nine.net, or I can pick up additions via comments added to this post. As always it’s a pleasure reading your posts..
We definitely use your blog to stay current with industry news.